Assessing cerebral anatomy and cerebrovascular flow, particularly in small vessels and the areas they perfuse, can be challenging under white light or near-infrared ICG fluorescence. 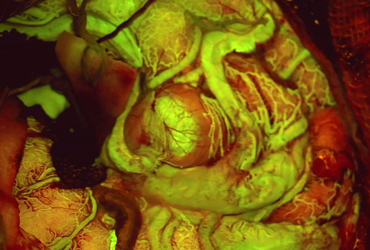 The FL560 fluorescence module, used with fluorescein, allows you to simultaneously view anatomical structures and real-time cerebrovascular blood flow, clearly differentiated and with high contrast. FL560 fluorescence is the first FDA 510(k)-cleared microscope filter for viewing cerebrovascular fluorescence in conjunction with fluorescein. A fluorescein procedure kit and instructions are available from Leica Microsystems, giving you confidence that your formulation, dosage and administration are correctly optimized for the FL560 filter. The proprietary FL560 filter combined with premium M530 OH6 microscope optics provides one complete, high-resolution, and high-contrast image for a crisp anatomical view and clearly delineated vascular flow even in tiny vessels. With a simultaneous view of anatomy and real-time fluorescence there is no need to switch back and forth between views. Activation is at the touch of a button on the hand grip or foot switch. 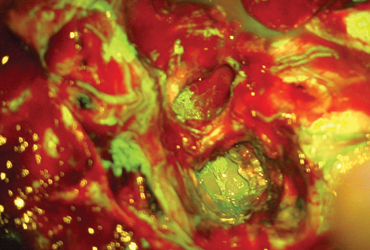 And, as fluorescein is visible for up to 1 hour, you may only need one bolus, further streamlining your procedure.